As always, we will wait to leave until conditions are better. Not that I’m complaining. We’ve had a wonderful time here. We finally took our kayaks in the water and this was the ideal place to do it. There are only two other boats here with cruisers on them besides Interlude and Seas the Day. Above I am paddling near mangroves and deserted beaches. We were alone on the water for as far as we could see, and the water goes for miles amongst islands, mangroves, and rocky or sandy shorelines. One time we came to a spot between two sand bars so shallow we had to get out and pull the kayaks for awhile. Kayaks have a few inches of draft so we can go many places in them where even dinghies won’t go. Plus, there is no motor running so you hear all the sounds of nature and nothing else. The two other boats with cruisers on them both have single sailers. 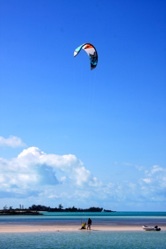 One of the guys has a kite board. At the left he is on one of the sand bars at low tide with his buddy from the other boat, as he gets ready to take off again. When the wind is strong, this is a kite boarder’s dream water......very shallow and flat. 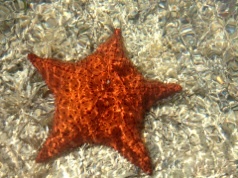 While we were paddling around the area we saw some sea life. 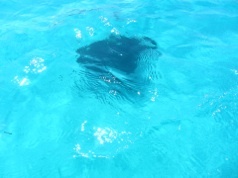 There are dozens of stingrays here making us wonder if this is a breeding ground for them. One was HUGE with about a 12 ft tail. The photo at the left is one of his smaller cousins. We also saw some very large starfish. The one pictured here was about 16 inches wide. (The camera wasn’t in the water to get this clear shot.) In the photo above we were going over coral, but there was very little to see. We came to one mangrove area with a pile of conch shells on some rocks, which is what you see when someone catches and cleans them right away. 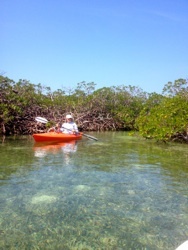 There was a narrow opening back into the mangroves (seen just behind my kayak) which we guessed was cut by someone so they could get back to the water where the conch live. It was so tight that we couldn’t use our paddles and had to pull ourselves through by grabbing mangrove branches. After reaching some open water, we paddled for awhile but were worried that we might not find the opening back to where we came from because there were many twists and turns, so we turned back. We have gone swimming whenever it was warm and not too windy. Except at slack tide, the current is always strong, so we take our dinghy near one of the sandbars and stay in the shallow water. The water is clear, the bottom has soft sand, and it is clean due to little boat traffic. One night we took our dinghies ashore to the nearby beach where Daisy goes for her walks. We followed a short path to the road, crossed it and sat on the rocks on the Exuma Sound side of Long Island watching the sunset. 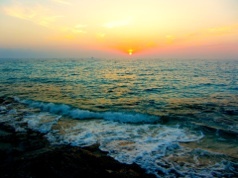 The waves were crashing on the shore as we waited for the sun to sink below the horizon. We brought cheese, crackers, and rum punch to snack on while we enjoyed the peaceful setting. One of the other neat things we saw and heard in Joe Sound was whistling ducks. We never got a picture of them because they only flew by in the dark, venturing out from their nearby home. I’m not sure what makes the whistling sound, but it is very distinct. A local resident named Sir Peter raises them. This might be the only place in the Bahamas where you can see and hear them since they are not indigenous to the area. We have played Mexican Train dominoes almost every night with Cathie and Tom (Interlude) and shared meals a number of times. We’ve also visited the Cape Santa Maria Resort for a few happy hours and meals. We could walk down a road a few miles to get there, but it’s quicker in the dinghies. 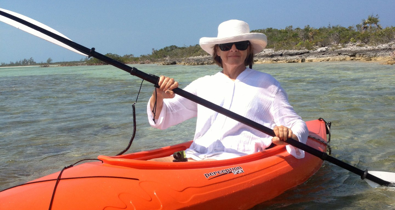 However, we can only do that by going out on the Exuma Sound, which is too choppy now. It looks like the winds will decrease and clock a little to the east so we should be able to get out of the inlet tomorrow. We’ll probably sail directly to Georgetown across the deep water of Exuma Sound because the seas should be down by morning. Joe Sound has been one of our favorite places to visit in The Bahamas, and we’re sure we will return. If Cathie and Tom had not brought us here, leading the way through the inlet, we probably wouldn’t have dared enter this anchorage. That is probably why many cruisers don’t come in here because it looks too narrow to come in. We will have a week’s worth of garbage to dispose of when we arrive in Georgetown and will make a visit to Exuma Market for fresh food. Small sacrifices to stay in a place off the beaten trail. I am making my mom’s rolls tonight so we’ll have warm caramel rolls to eat in the morning. Click here for more photos of Joe Sound.